As part of the Inside Careers series of Employer Q&As in January 2013, Harrison Goddard Foote (HGF) answered your questions. Find out more about HGF and their graduate opportunities in patents. How can I best prepare myself for interviews? What good sources are available to know more about the industry and latest IP news? The Inside Careers guide is an excellent resource for understanding more about the role of a patent attorney. IP law is an area of law which appeals to me. In the current and future market do you believe IP law will continue to grow as a market? In the 1980’s 80% of the FTSE 100 companies value was in their tangible assets. Now 80% of their value is held in their intangible assets, a significant part of which is intellectual property. There is an increasing recognition in the Boardroom of the value of IP. High profile IP disputes, such as the Apple v Samsung case, are likely to see this trend continue. China is now the biggest patent filer in the world, having taken over from the USA, as it moves away from the traditional low-cost manufacturing economy. These changes in the world economy we believe will provide a fantastic opportunity for IP professionals and mean the IP profession is likely to continue its trend of growth in the long-term. 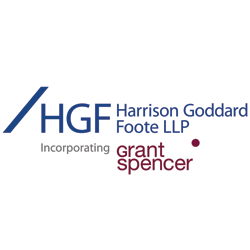 HGF’s current vacancies are for Engineering and Electronics Patent Attorneys. Are you recruiting any chemists this year are trainee patent attorneys? Yes we have plans to recruit Chemistry graduates for Trainee Patent Attorney roles later this year. You are welcome to send in your applications to us in advance of us advertising a vacancy as we keep suitable candidates in mind for future vacancies. Would taking a gap year affect my chances of being offered a position with you? Do you offer jobs with the possibility of deferring the start date? We do not usually offer jobs with a long-deferred start date of a year as we recruit according to our need in that current year. Of course, we do offer jobs to candidates who are in their final year of an undergraduate degree or PhD where there may be several months between the interview and the day they actually start work with us. What is the structure of the Harrison Goddard Foote graduate training in regards to length and placement rotation? It typically takes 3-5 years to complete all the professional qualifications required to become a patent attorney. Each trainee is given a training budget that they can spend as they see fit to pay for exam fees, external courses and other training as we think we get better results if our trainees can individually select the courses that are most suitable for them. Training is mostly on the job, working closely with a partner and/or other senior qualified patent attorney, in order to gain practical experience of the day to day skills you will need to pass the professional exams. We have created a supportive structure for trainees in order that they have the best chance of success in their qualifications. Our trainees are nearly always recruited to work in a specific one of our offices and so we do not rotate trainees for placements in other offices. That said, we operate on a firm-wide basis and you will regularly come into contact with trainees and attorneys from other offices and other technical groups to your own. Does having a PhD offer you an advantage in terms of entering the profession, partnership or promotion prospects, or job security? Or do graduates entering the profession directly from university have the same prospects? All our graduate entrants have the same career prospects within HGF whether they have a PhD or not. In some technical disciplines (especially life sciences), having a PhD is a distinct advantage for entering the profession, but in others it matters less. In all technical disciplines, your aptitude for the patent attorney profession and your communication skills are the most important factors in our selection criteria. Do Harrison Goddard Foote offer internships? If so what is the application process? Are internships available to international students? Yes, we have had interns at HGF in the past but it is fairly infrequent and usually linked to a short term project or a planned future recruitment. From our point of view it is a great way to do an ‘extended interview’ of a potential employee although it is a significant drain on the supervisor;s resources so it depends on who is available (and in which offices). We would need to ensure confidentiality of our cilents’ work and, in a short internship, the candidate might not really get a true picture of the varied nature of the profession. There is no formal application process, but you should write to us to express your interest in the same way as if you were applying for a trainee vacancy i.e. by providing your CV together with a covering letter detailing why you want to become a patent attorney. The covering letter is primarily so we can see how well you write, as that skill is so essential to the job. International students are at no disadvantage so long as they meet the requirements for representing clients before the European Patent Office. For this it is necessary to be a national of a European country (list of countries is here http://www.epo.org/about-us/organisation/member-states.html#contracting). What prior knowledge of the field is required outside of your degree? We do not expect candidates for our trainee positions to have any significant prior knowledge of IP law or the other skills required to be a patent attorney. Having said that, the more background reading you have done about the profession and the basics of IP law, the better. One of the skills of a patent attorney is the absorption of large quantities of information in order to distil it down to the key issues, so the interviewer will be interested in how much background research you have done and how well you understand what being a patent attorney involves. With so many graduates looking for jobs at the moment, how can an individual stand out and make you want to hire them? What attributes do you look for in potential candidates? There are some fundamentals that every candidate needs to have: a degree in a scientific, engineering or other technical discipline, good A level or Highers grades, excellent written communication skills, in interest in how things work and the aptitude to quickly grasp new technical concepts, good analytical skills, attention to details, and an understanding of and interest in what the patent attorney profession involves. Written communication is so important because the careful and precise use of language is fundamental to what we do. This is why we ask all candidates to write a covering letter detailing why they want to become a patent attorney. We may also ask candidates to do a written test at interview. I have an intermediate level of Japanese. Are foreign language capabilities helpful in patents? Knowledge of a foreign language is not essential in order to be a patent attorney. The language requirements in the professional examinations have been relaxed (previously candidates needed a good working knowledge of either German or French in addition to fluent English). All professional examinations are now available fully in English. That said, knowledge of German or French can be useful on a day to day basis as we often come across patents in those languages, however such knowledge would not make a significant difference to your prospects of selection for interview. Japanese, Chinese or Korean would make you attractive to a potential employer as these are key markets for our clients. Am I disadvantaged as a potential candidate for a job vacancy at HGF as I am not British and did not pursue a degree in the UK? You are not disadvantaged by not having obtained your degree in the United Kingdom, providing your degree is from a reputable university. However your nationality may be relevant. We expect all our trainees to represent clients before the European Patent Office when they eventually qualify as European Patent Attorneys. For this it is necessary to be a national of a European country (list of countries is here http://www.epo.org/about-us/organisation/member-states.html#contracting). Exemptions in certain circumstances are available and it is our understanding that exemption requests are usually granted. Nowadays do you have to train as a European Patent Attorney in the UK or is there still a desire/need for UK only patent attorneys? We expect all of our trainees to eventually qualify as both European Patent Attorneys and UK Patent Attorneys. The European qualification is probably more significant as we do most of our work at the European Patent Office. Is it worthwhile to study for the PG Certificate in Intellectual Property Law before applying for patent vacancies? In some cases having this certificate before applying for vacancies would make you a more attractive applicant, but not always. This course will provide you with an exemption from the first set of professional examinations, so you will be more attractive to many potential employers for that reason. However, most trainees start in the profession with no prior knowledge of intellectual property law. The majority of our trainees attend this course after they have joined us (this being the usual route) but if you have completed it already, you will be unusual in starting at your employer already having a good grounding in IP law and can hit the ground running. Are interviews with Harrison Goddard Foote based on practical skills or on the candidates potential for the role? We do not expect candidates for our trainee positions to have prior knowledge of IP law or experience of the practical skills required (other than background preparation for the interview). At interview we are assessing all aspects of your potential for the role. We supplement the interview process with some practical tests as well, e.g. of written and oral communication skills, accuracy, and invention spotting. We also ask second interview candidates to complete a psychometric test which indicates how you tend to behave in the workplace. This helps us look at your potential as well as your current attributes.